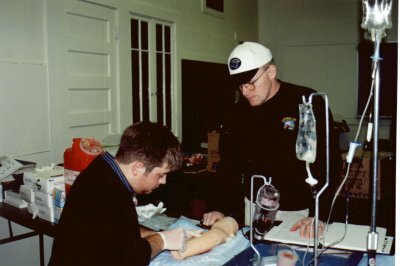 EMT-Intermediates are qualified to perform advanced level assessments, administer intravenous fluid therapy, and in many states, perform advanced airway management and administer a variety of medications. The EMT-Intermediate course may be an end in itself, or it may be your first step on the path to Paramedic certification. The ALS Institute's Intermediate program is condensed to provide students with an alternative to longer nighttime programs. Our two-week Monday through Friday course includes the didactic and laboratory portions of the program. With EMT-Basic certification as a prerequisite to this course, students enter the program with a basic working knowledge of anatomy and physiology. During this course, we focus on acute assessment skills based on a more advanced comprehension of anatomy and physiology. Topics covered include cellular biology, fluid and electrolyte balance, and the cardiorespiratory system. Medical and traumatic emergencies are discussed in terms of their pathophysiology, and advanced interventions for their treatment are introduced, including intravenous cannulations, intraosseous infusions, and airway management (esophageal obturators and endotracheal intubations). Skills are practiced in guided laboratory settings. Legal and ethical issues involved in advanced interventions are introduced and discussed. Following successful completion of the course work, students participate in objective-based clinical experience which focuses on the practice of newly acquired skills in a supervised environment, typically in the hospital emergency department. We maintain clinical affiliations with with a number of large urban hospitals as well as rural hospitals. Students are encouraged to complete their clinicals at the primary receiving facility for their service whenever possible. Upon completion of the clincal objectives, students are eligible to take the National Registry Intermediate level exam.